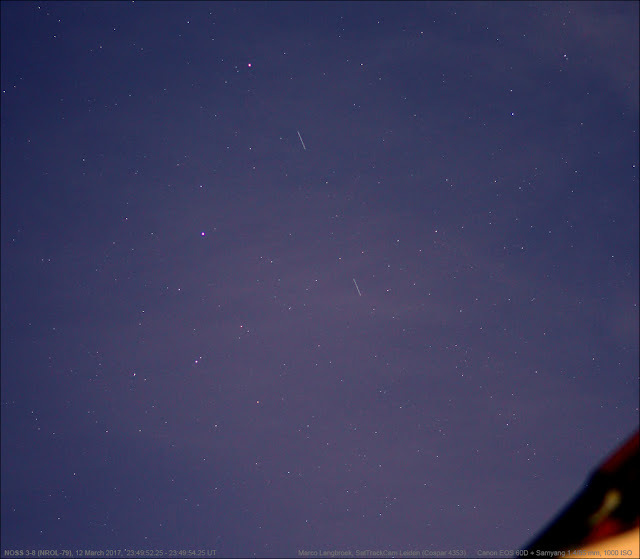 The image above shows the new NOSS 3-8 duo (2017-011 A & B, launched as NROL-79 on March 1, see my earlier blog post here), aka USA 274, imaged on March 12 through very thin cirrus. Over the past 2.5 weeks a number of us (Leo Barhorst, Cees Bassa and me in the Netherlands; Russell Eberst in Scotland; Alain Figer in France; and Paul Camilleri in Australia) have been chasing this duo and monitored their manoeuvering, consisting of small adjustments in apogee and perigee and orbital period. I expect their manoeuvering to be complete by 21 days (3 weeks) after launch, i.e. near March 23. They will then have attained their finalized separation distance. I expect this initial operational distance to be about 45 km. I do not exclude further small manoeuvres after March 23 though, but these will be more as a pair, and not with respect to each other. NROL-79 consists of a NOSS (Naval Ocean Surveillance System) duo: two payloads orbiting as a close pair (typically 30-55 km). The second object is catalogued as "debris" by JSpOC (they did this with all second payloads of NOSS launches), but isn't: after all, real debris shouldn't manoeuvre, and shouldn't stationkeep with respect to the other payload. After insertion in a 1010 x 1204 km, 63.45 degree inclined orbit, the two payloads started an intricate dance in space, step by step positioning themselves with respect to each other. 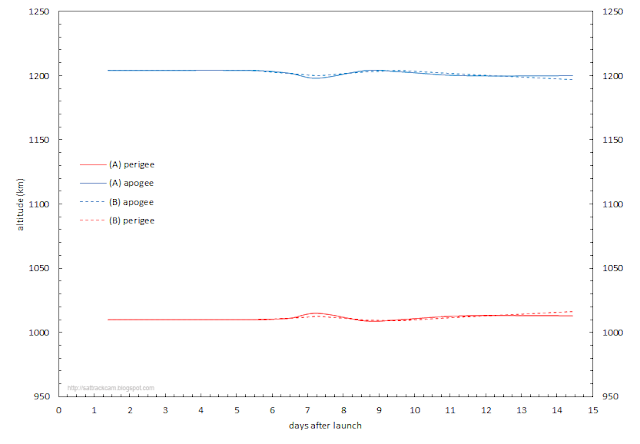 In the initial week after launch the two payloads separated at a rate of ~31-32 kilometer per day, to a maximum separation of just over 200 km on Day 7. Then their drift reversed, with the two payloads gradually moving closer again (see diagram above, which also gives similar data for a previous NOSS launch, NROL-55 (NOSS 3-7) from 2015). Extrapolating the drift, and looking at the previous NOSS launch, I expect that by the end of the 3rd week after lauch (~March 23, 2017) the two payloads will reach their intended separation of ~45 km, and stabilize with respect to each other. It is interesting to note the difference with the previous NOSS launch, NOSS 3-7, also depicted in the diagram. 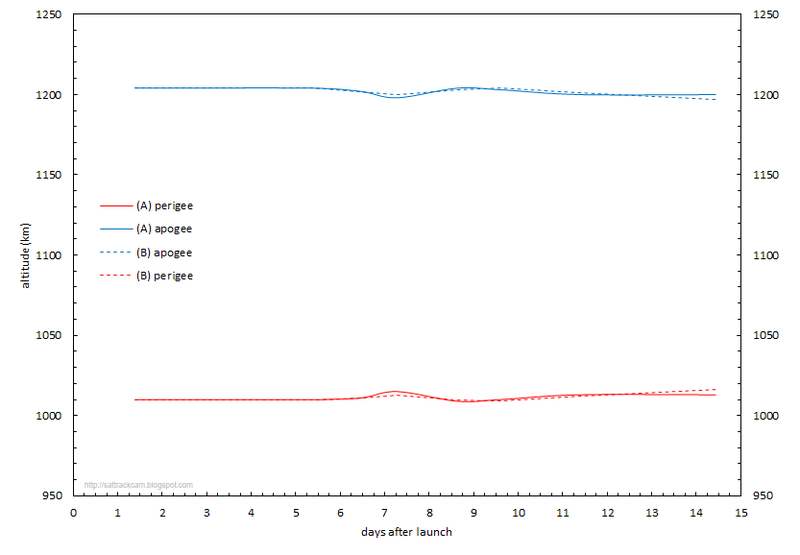 The latter initially drifted further apart, and for a longer time: the separation increased until 14 days after launch (double as long as for the current case), to as much as ~570 km (almost three times as large as the current case), before the two objects started to move closer again. Around that same date, the visual brightness of the two objects changed. The latter probably signifies the deployment of something on the payloads: either antennae, or perhaps panels used to make minor orbital adjustments by decreasing or increasing drag (it has long been rumoured that this is one of the ways the NOSS payloads maintain their bond). The pattern between the current launch and the previous launch is similar (although I have a suspicion that for the previous NROL-55 launch in 2015, analysts switched the identitities of the two objects around day 6): a major orbital period adjustment on day 6, after which one of the payloads gradually increases its orbital period again while the other very slowly decreases its orbital period. 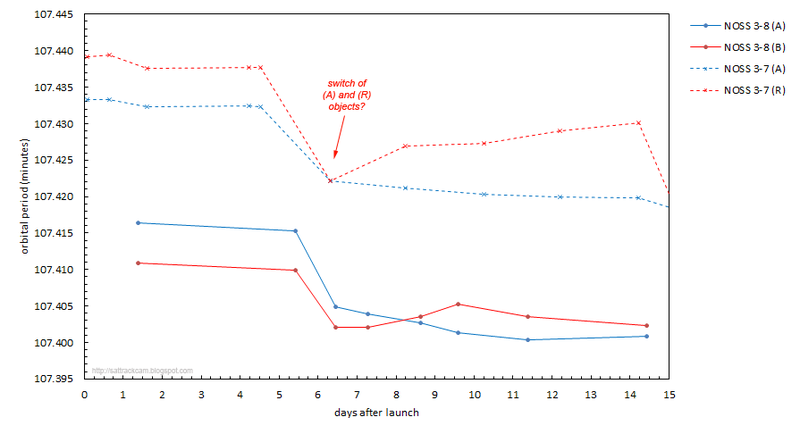 But what can be seen is that for the current case, the values for both payloads stay much more similar than was the case with the previous launch, just as with the evolution of the spatial separation of the two. One of the things this could point to is that, perhaps, the initial orbit insertion of NROL-79 went better than for NROL-55, but this is speculation. Note: orbital calculations for NROL-79 used were done by myself using observational data from the persons mentioned in the main text. 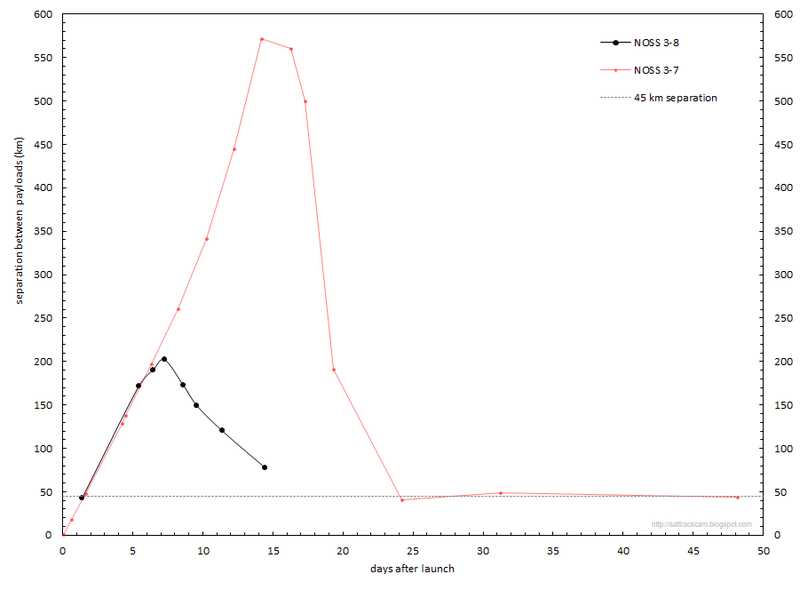 The NROL-55 orbit calculations from 2015 were by Mike McCants and Ted Molczan. I am indebted to Leo Barhorst and Bram Dorreman for their help in filling gaps in my archive of orbits for the latter object. Thanks Vitaly, a typo indeed! I have corrected it.